Your wine collection has started to grow. You’re not a novice anymore, but a true wine aficionado. So, it only makes sense to store your bottles in the best conditions. But, buying the first dedicated appliance is far from easy. That’s why I’ve made this guide on how to buy a wine fridge. I remember the confusion of having to pick my first wine cooler. I didn’t know what technology to choose, what capacity, nor what features to look for. Now, I want to help you avoid passing through the same doubts. Read on to find out what to look for and how to buy a wine fridge in 5 simple steps. Let’s start with the basics. The first thing to decide when buying a wine fridge is the type. Wine coolers can be classified based on the cooling technology, type of installation, temperature zones, and more. The two more important things to decide when buying a wine fridge is the cooling technology and the type of installation. Based on their cooling technology, wine fridges can be cooled by a compressor or thermoelectric technology. Use the same system present on the standard kitchen refrigerators which consist of a compressor, evaporator, coil system and a fan. These coolers do an exceptional job in keeping your wines at a constant temperature, but they vibrate and are noisier than the thermoelectric units. Don’t actually cool the air in the cabinet but conduct the hot air out. Their performance is influenced by the environmental temperature and is not indicated to use if you live in a warm climate area and use no A/C in your home in the hotter days. However, these wine coolers are environmentally friendly, silent, and produce no vibrations. Based on the type of installation, we can distinguish between freestanding, built-in, and countertop units. Freestanding wine coolers: Are typically large appliances with capacities of at least 18 bottles designed to be installed on the floor, like a regular refrigerator. These are ideal for the serious wine lover who is determined to grow their collection. Built-in wine coolers: As their name suggests, they can be installed inside a kitchen cabinet or under a countertop. These wine fridges are compressor type; the thermoelectric wine coolers cannot be built in. Countertop wine coolers: Similar to the freestanding but smaller, these appliances are ideal for those with small collections. The thermoelectric type is often silent enough to place in a living room or home office without disturbing, and most countertop units have a decorative effect. The next step is to decide the capacity of the wine cooler. Do that based on how small or large your current collection is, but don’t forget to foresee how much your collection will grow in the near future. 6-bottle wine coolers: Ideal for the novice but also for those who only want to exhibit a few expensive bottles. 12-bottle wine coolers: Perfect for those who want to store a few bottles but consume most of the wine quickly after it has been bought. 18-bottle wine coolers: The perfect capacity for the novice who is serious about wine drinking and collecting. These appliances give you plenty of space to grow into. Smaller and larger capacity fridges are also available. For instance, if you like to make your own wine at home, investing in a 24-bottle wine cooler could be a wiser idea. At this capacity, some coolers come with the chic French style doors that look amazing in most interior styles. A side note when buying a wine cooler, remember the stated capacity rarely matches the real one. Account for at least two fewer bottles, especially if your wine comes in larger style bottles, like those of Pinot. Do you want to store, chill, or both? Do you enjoy both reds and whites or only one type? Answer these questions to determine how many cooling zones you need. The vast majority of the wine fridges on the market come with one or two cooling zones, but the higher end models boast three. Single zone coolers: Are ideal for those who only drink one type of wine or who are looking for the right appliance for storage only. This is because all wines must be stored at 55°F. Dual zone coolers: Have two compartments that allow setting different temperatures. They are perfect for those who want to store two types of wine at temperatures closer to their serving temperature, or for those who enjoy only one type but also want to keep a few bottles at serving temperature. Triple zone coolers: Perfect for storing both types of wines and keeping at serving temperature both reds and whites. These wine fridges are the most versatile but also the most expensive. Furthermore, finding a fridge with these characteristics is quite hard. Outgrowing your wine fridge happens faster than you might think. Removable shelves allow you to maximize the storage capacity by stacking the bottles instead of keeping them displayed on shelves. If you’re a rookie, collecting labels might seem weird. The truth is almost all wine lovers collect labels. Why? Because it helps them learn about wines and remember which was a good selection. That’s where wooden shelves come in handy. They are not only sleeker but are less prone to scratching or damaging the paper on your bottles. Wine fridges act as showcases for your expensive bottles and all of them have a glass door. Since wine is sensitive to light, make sure that glass is smoked and UV resistant, to prevent harmful rays from altering your beverage. Some wine fridges have sleek interior lights that not only help you see the bottles but make the appliance more attractive. The interior light is not essential, but trust me it’s a nice thing to have. We all know wines need a constant temperature. If you’ve done your homework well, you also know they need constant humidity. So, it’s only logical to invest in a unit that comes with this feature. This feature is particularly crucial for reds and sparkling wines. Vibrations can disturb the wine sediment or the bubbles. Thermoelectric units are virtually vibration-less, but some high-end compressor models also impress with this quality. Digital controls are easier to operate, more precise than analog knobs, and often equipped with LCD screens that show you the temperature and settings. Another desirable feature is a reversible door, which will give you the possibility to move the appliance from one place to another and still install it perfectly in the spot, regardless of what side the door has to open. Do you want to restrict access to a few very expensive bottles? Do you have kids and are concerned about them and the wine living under the same roof? Get a wine fridge with the door lock. There are many systems to consider, from digital locks to traditional key locks; there are plenty of options to choose from. Lastly, an important thing to think about is the energy efficiency of the appliance you’re buying. In broad terms, compressor units tend to consume more energy than the thermoelectric ones if you need a small wine fridge with capacity under 30 bottles. On the contrary, the energy efficiency of the compressor units is higher on appliances over 30 bottles. Regardless of your choice, make sure the fridge is A++ marked in terms of energy consumption if you want to keep your bills as low as possible. 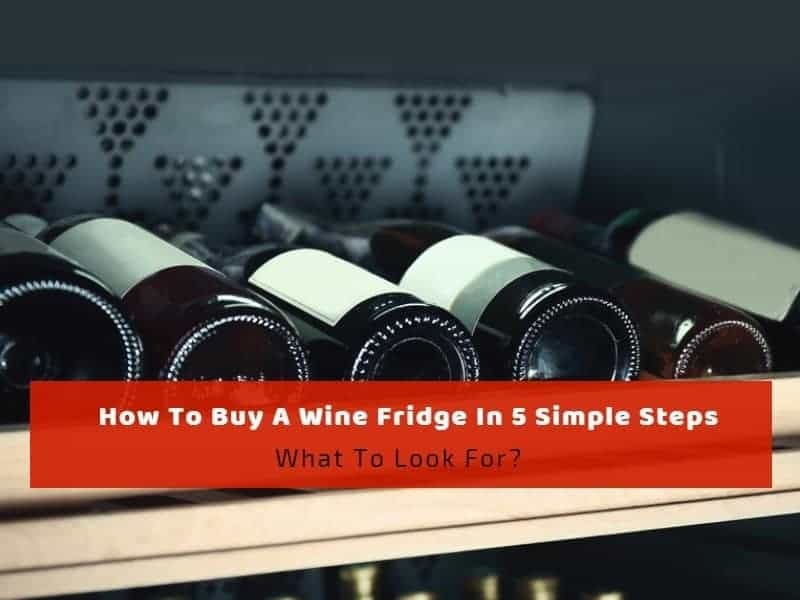 Buying the right wine fridge might not be easy, but the steps above can certainly help you find the right appliance for you. The most important thing to consider is the technology. If you live in a warm climate area or need a large appliance, the compressor is your best bet. Thermoelectric units tend to lose their efficiency in high temperatures or large capacities. Instead, if you need a small wine cooler to store in your office, a compact thermoelectric appliance could be the right one for you. Silent and environmentally friendly, it gives you just the right space where to display your expensive bottles. What else would you consider when buying a wine fridge? Do you have any tips and tricks? Let me know by commenting on this post!